Incursion 2 The Artifact is a free tower defense game in which you try to fend off invading forces with heroes and recruited troops. The game uses a slightly different design than most tower defense games. While you play a series of maps that are linked together by a story line, you don't build towers as you would in many other tower defense games. The towers, or huts act as recruiting points for foot soldiers, archers and wizards that you may recruit. Each hut supports a maximum capacity of three units. You can mix and match or recruit a single unit type only but need to know that units move and attack as groups. If you stick a soldier into a group with two archers, you'd end up risking the life of the archers as they may come closer to the enemy units than they should. You begin the game with the main hero and a little bit of gold, and the first map acts as an introduction to core concepts. Recruit a couple of basic troops and try to fend of the enemies. Heroes may roam the battlefield freely while the movement of regular units is restricted to a radius around the tower they have been recruited from. Tip: you can move ranged units away from the roads so that melee attackers can't reach them. This won't protect them from ranged enemies but it offers some form of protection that the ranged units need desperately to stay alive. Warriors spawn in the huts and will come back if they are defeated in battle. 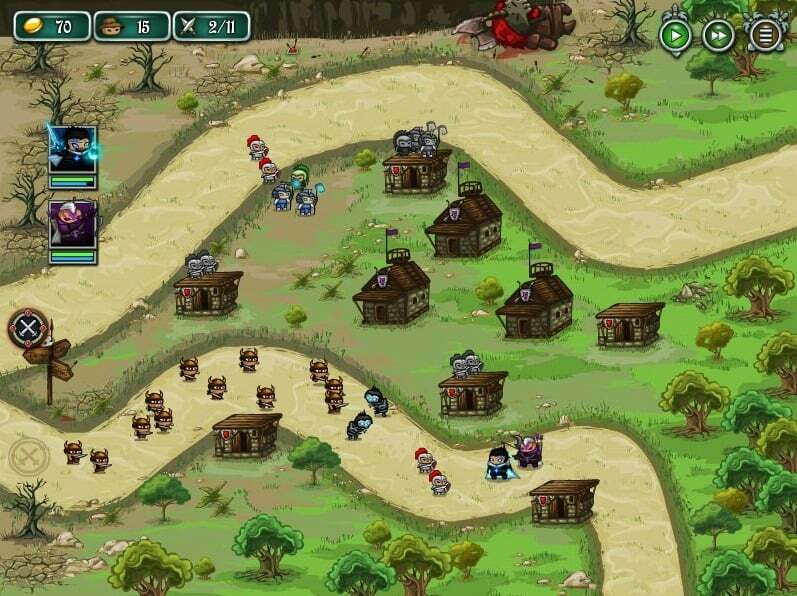 You will encounter many different monsters and enemy units over the course of the game: from traditional cannon fodder melee units and archers to necromancers that raise zombies or juggernauts that are hard to defeat because of their armor. Different enemy types require different strategies. Juggernauts take only a quarter of damage from arrows while skeleton archers may require the use of spells to defeat them quickly before they take out your melee units. Flying units, on the other hand, can only be attacked by archers and mages. The main hero gains experience points in battles and skill points when the level increases. 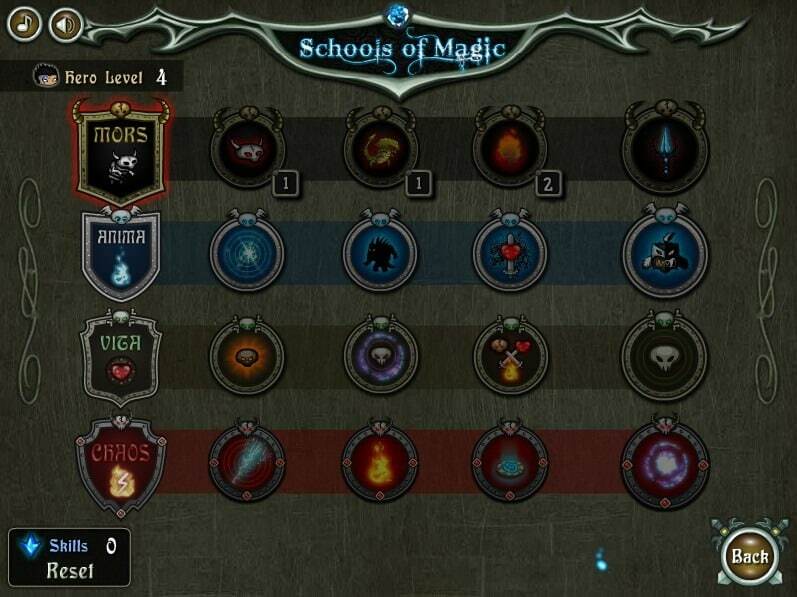 Skill points can be invested in four schools of magic to throw meteors at enemies, slow them down, or hurl them. A total of 16 spells are available that the main hero may learn. The game includes a reset option which is great for testing various spells without making a commitment the moment you select one of the spells. You control additional heroes over the course of the game; these come with their own set of skills that you may use directly. You earn general skill points during battles as well and may spend them to improve the three unit types or invest them in general upgrades. Skills may increase the damage output of units, reduce their price, or increase their attack range. The general purpose skills make units move faster, give you more gold in the beginning, or speed up the reincarnation of fallen warriors. Unit upgrades are unlocked with each map that you complete. You can't upgrade any unit on the first map but may do so from the second map on. Upgrades improve unit stats such as attack or defense but may switch the unit type to a different type altogether as well. If you upgrade archers multiple times, you will end up with dwarven mortar units that do area damage. Upgrades cost gold and you may only start to upgrade units once you have recruited all three. Incursion 2 The Artifact is a well designed tower defense game. While it is not the first tower defense game that puts the focus on unit recruitment and heroes, and not on the building of towers, it is well designed and plays great. The game comes with three difficulty levels. Absolute beginners may want to start with easy but veteran tower defense players may want to skip the normal difficulty as it is a bit too easy in my opinion to be really challenging. Incursion 2 The Artifact requires a bit of micro managing units, directing archers and mages to attack flying units, or charging enemy archers with melee units to avoid having them attacked without any form of counterattack.